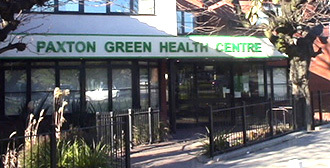 You will need to live within our catchment area to register as a new patient at Paxton Green Group Practice. After you have completed this online form, please allow three working days and then visit the practice (between 8.00am and 6.30pm) bringing with you proof of your address (a household bill or statement) and if possible your NHS Number. When you visit the practice you will have a short check of weight, height and blood pressure. In addition to proof of address, you will need to bring in your child’s Red Book (Personal Child Health Record) or provide us with a certified record of previous immunisations. Immunisation records are very important for the well-being of your child: collecting this information will ensure that we have an up to date record, including when the next vaccinations are due. Please complete this online registration form with your child’s NHS number and a contact phone number. Once we have received your online registration form we will contact you to arrange a post-natal check and baby’s first injections. If you are already registered with us and have just had a new baby, Paxton Green Group Practice would like to welcome your new baby to the practice and ask you to register your son or daughter with us as soon as possible. Please complete a registration form either online or by downloading the above form with your child’s NHS number. If you have downloaded the form, upon returning please ask us to put you and your baby on the waiting list for your post natal appointment.